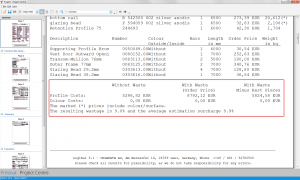 You can determine your own percentage for the wastage in the estimation data. 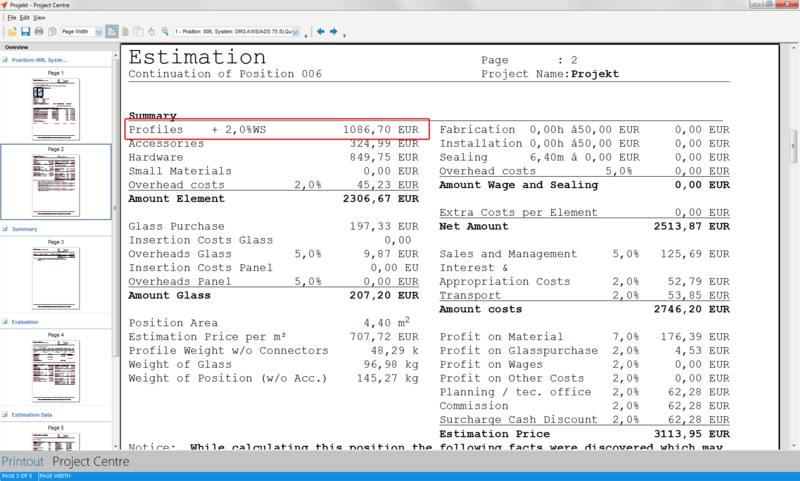 Select „Estimation data“ → „Costs“Taxes“ → „Wastage“ and enter the percentage. 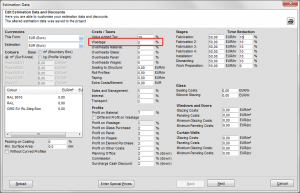 In the estimation printout the percentage determined by you will be listed in the summary. 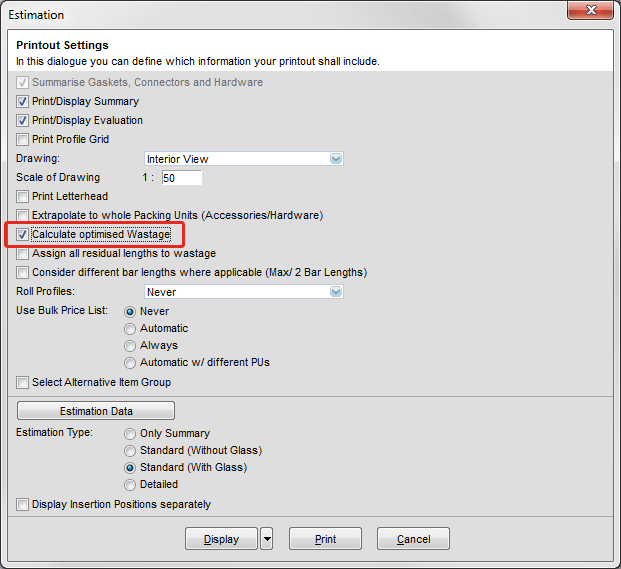 To let the software determine the wastage automatically, activate „Calculate optimised wastage“ in the printout option of the estimation. 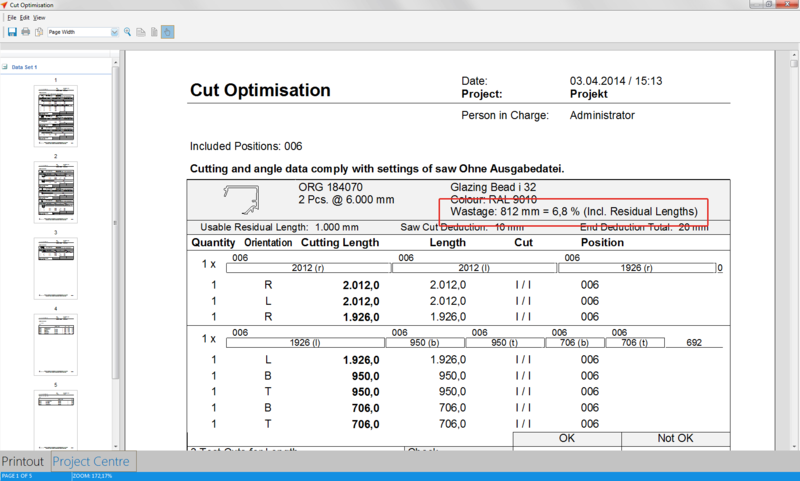 The percentage for the optimised wastage consists of the total end deduction, the saw cut deduction and the residual length. 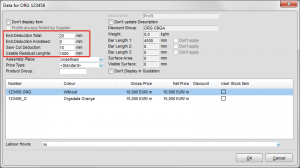 The standard settings for the automatic estimation of wastage depend on the profile supplier and can be looked up in the opti database. Click „User database“ → „System Items“ and select the profile supplier. 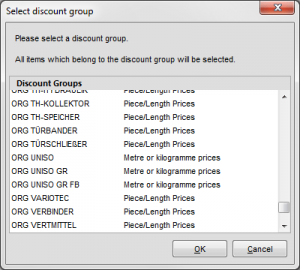 Select an article and click the bottom left button „Opti-data“. 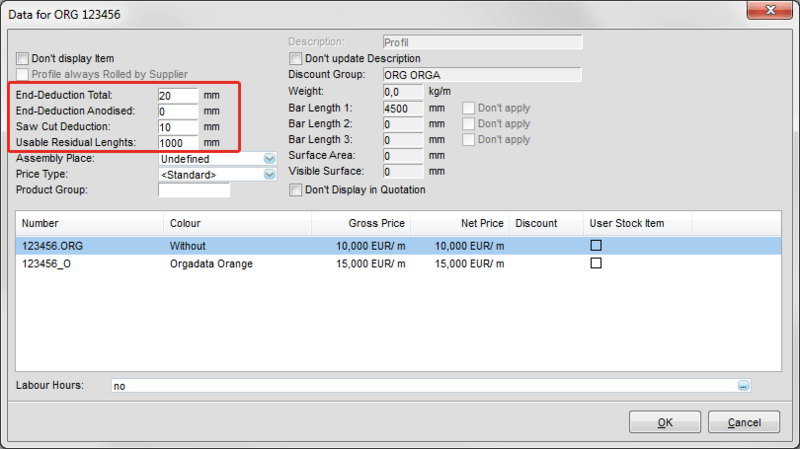 In the form „Edit opti-data“ you have the opportunity to align the opti-data individually. Mark the relevant article and enter the data for end deduction, residual lengths and saw cut deduction. 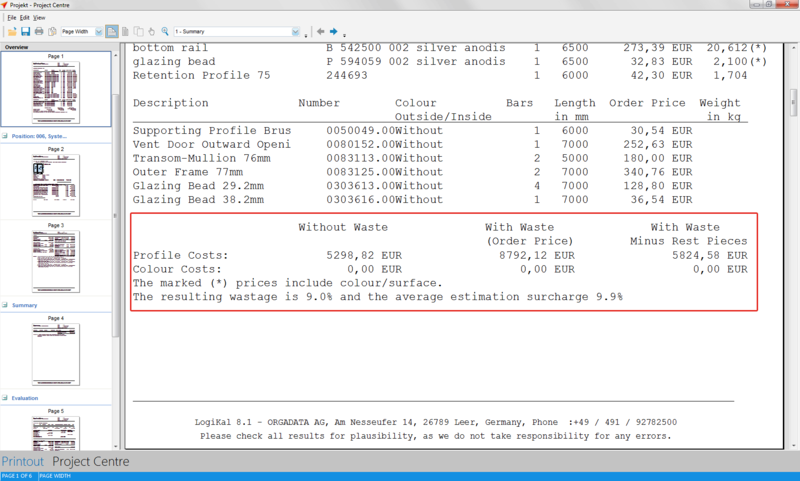 You can also mark parts of a particular price class. 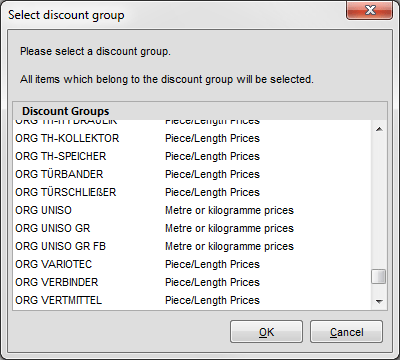 Confirm „discount groups“ in the toolbar. 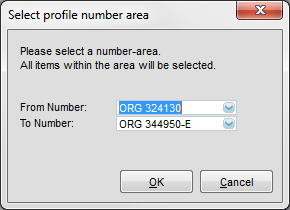 To select profiles from a fixed area click „profile number“ in the toolbar. 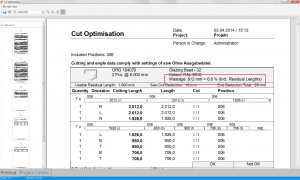 You can assign the settings for the cut separately for every profile. 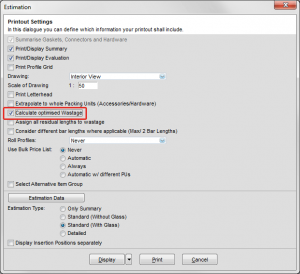 Select a profile by double clicking. 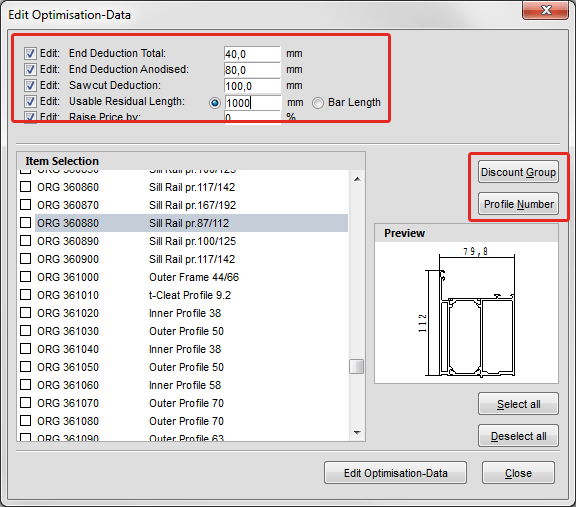 In the following program window you can enter the optimisation data. In case of an update the data will not be overwritten. 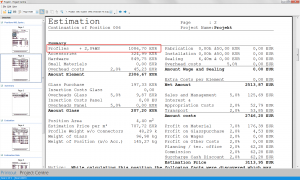 If you activate the tab „Calculate optimised wastage“ in the printout option of the estimation, the resulting wastage and the averaged estimation surcharge will be listed in the optimisation printout. 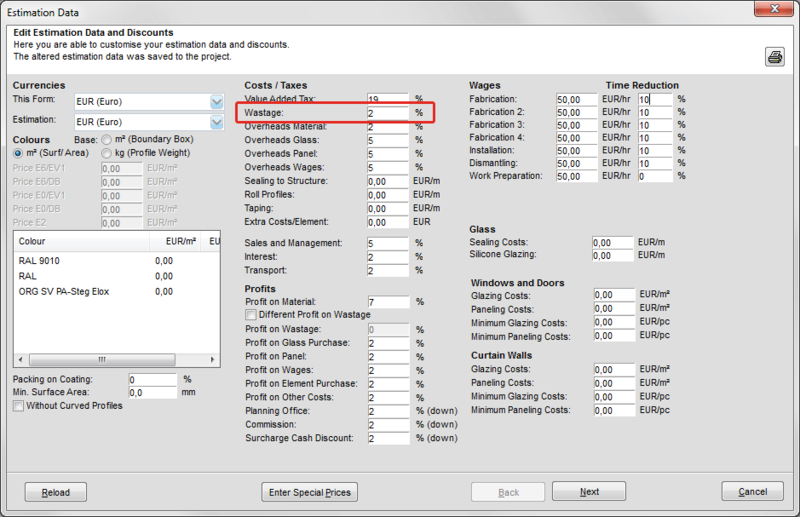 Estimation is done with the averaged estimation surcharge of the other position (s) or with the wastage as available in the estimation data, if the option „Don’t save optimised wastage“ (Settings/Additional settings/Printouts) is activated. 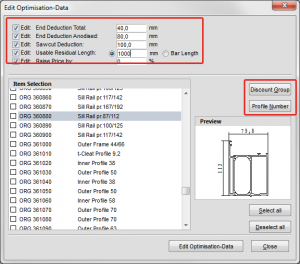 In the estimation the averaged estimation surcharge is listed in the configuration. You can add the residual lengths to the wastage. Activate „Assign all residual lengths to wastage“. This function is only available if „Calculate optimised wastage“ is activated. If you activate „Assign all residual lengths to wastage“, the estimation printout will show an according note.